Recently Collider got hold of what actor Bryan Cranston had to say about returning to the set of the highly acclaimed AMC drama series Breaking Bad, which kicks off filming for its fifth season on March 26th, his plans to direct again, and how happy he is that director Rian Johnson will be returning for an episode. He also talked about the episode that he has just directed for the ABC comedy Modern Family and what it’s like to be a guest director. Check out what he had to say after the jump. Are you just a total workaholic? Is that what drew you to something like Detachment (which just opened on March 16th)? CRANSTON: I haven’t seen it. CRANSTON: I felt that Carl Lund, the writer of Detachment, wrote a really beautiful, haunting script, and I didn’t feel that it was honored. I was upset with that. I really was. So, I didn’t see the movie. (Director) Tony Kaye is a very complicated, interesting fellow. I don’t believe that I’ll be working with him again, but I didn’t not get along with him, from a personal level. I really honor the writing. I think writing is the most important element there is. It is the springboard, where everything starts. If you don’t honor that, which I didn’t feel was done on Detachment, then where are you? And I’m not the only actor on that movie that feels that way. It was an interesting thing. If it turned out good, then I’m happy for that, but the experience is important for me, too. I don’t want to be in a movie, just to be in a movie, or pump things out. I want to be able to look back on everything that I’ve done and be proud. It doesn’t mean it has to be a box office success. It doesn’t meant it has to be absolutely lauded by every critic. But, I want to be able to please myself and look back and say, “You know what? That didn’t get attention, but take a look at that movie again. There’s something there.” That’s where my pride falls in line. 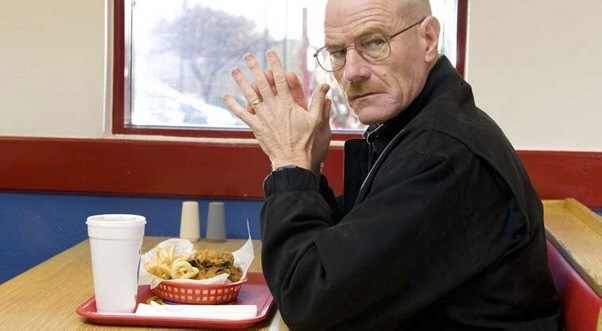 When you’re playing a character like Walter White on Breaking Bad, that you get to come back to repeatedly, is there any difference for you, in that process, then when you have a character that you’re playing just one time in a film? CRANSTON: Yeah, very much. I’m so excited. I finish Get A Job on Thursday night, after two weeks, and I’m on a plane on Friday morning. I’ll buzz my head over the weekend, and be in front of the cameras on Breaking Bad on Monday. Rian Johnson (Brick) is super-excited to be coming back to direct an episode this season. CRANSTON: Good, I’m glad he was set. We were talking and trying to get him to come back. He deserves to come back. He’s a really terrific filmmaker, but that’s not enough. You have to fit in. As I get older and I’m leading casts, and producing a show and being a part of that, it truly is, “How are they to be with for 13 or 14 hours a day?” I won’t stand to be with someone who yells at me, or yells at other people. Life’s too short. I go to work because I love to work, but if someone’s abusive, that’s the end of that. I’m not into that. Are you looking to direct another episode? Is it different for you to direct your own cast, as opposed to when you’re the guest director on another show? CRANSTON: There’s a clear, distinctive difference between directing TV and directing film. When you’re directing film, you are the person who sets the tone, the style, the pace and the relationship with the actors. With those actors, you’re creating those characters with them because you’re guiding the nuances of that. And then, it’s over and you all go your separate ways, and you get to go into editing and finesse it. An actor, in that case, unless you’re a superstar and you have all the power, you’re basically a hired hand. In television, you are a guest of the crew. You’re not even a member of the crew, really. You come in, you prep for a week, you shoot for a week and you’re gone. When I did Modern Family, I wasn’t there to say, “I’m going to change these characters!” No. You are there to follow the system. I feel that, when I direct TV, I need to give my showrunner what he or she needs. I’m not about to tell the actors, “Yeah, change that point of view.” But, I can suggest maybe downplaying that color right now because it’s really going to come in later on, in the story. You can maneuver, but you’re not going to wholesale change anyone. And then, it’s a real success, if you look back and go, “There were three, four, five or six ideas that I put in, that are clearly mine, that stayed in the show.” Then, you’ve done a good job. And, you have to bring a good attitude and pace yourself, so that the studio doesn’t go, “He’s killing us! We’re not going to finish. Now, we’ve got to have an extra day.” Then, you’re really shooting yourself in the foot. The pace of television is different then it is in features. You can see Bryan Cranston next in Rock of Ages which will be in theatres on June 15, 2012.